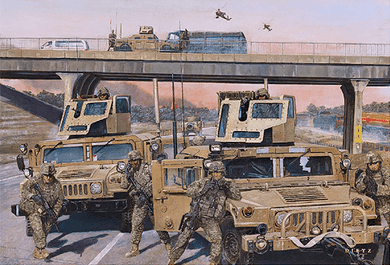 James Dietz Handsigned and Numbered Limited Edition Print:"Highway To Freedom"
About the Artist: In June 2007, 3-73 CAV Squadron arrived at Convoy Support Center (CSC) Scania, Iraq. The Squadrons Area of Operation included security of Main Supply Route Tampa, the main artery linking Kuwait to Baghdad and numerous outlying towns. The area also included a maze of irrigation canals and farmland. As soon as 3-73 CAV hit the ground at CSC Scania, the Squadron worked to establish a relationship with the local population, to establish local governance, civil military operations and local security. 3-73 CAV was charged with the responsibility of protecting CSC Scania from hostile threats. With local Iraqi Security Forces assisted numerous high value targets were either captured or killed. When 3-73 CAV first got boots on the ground indirect fire at CSC Scania was the number one threat with attacks averaging 3-4 times per week. By the end of the deployment attacks had become non-existent. 3-73 CAV took on the mission with securing 140KM of MSR Tampa. IED's and EFP's on MSR Tampa dramatically decreased over the course of the deployment. By the end of the deployment, the Squadron Area of operation had nearly tripled in size. With the assistance of local Iraqi Security Forces, (ISF) operations across the Hilla River swung into high gear. Local ISF began to take back the city of Hashiymah, Qasim, and Hamza. 3-73 CAV also fostered programs such as the Concerned Citizens Program. Throughout the AO Iraqis began to take charge for their own security and governance. Paratroopers in 3-73 CAV made a dramatic impact on the local citizens in both Babil and Diwanyiah provinces. The paratroopers of 3-73 CAV returned home with their heads held high knowing they accomplished the mission and honored the sacrifices of the men and women who came before them.